Welcome to your introductory course to all things tire sealant! 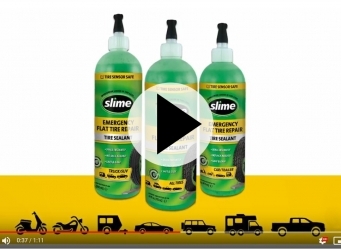 In this Slime Tire Sealant 101 video, you will learn about the important key features behind the different types of Slime tire sealant so you can pick up the bottle that is right for your tire needs. Wondering what tires you can use Slime on? Trying to figure out if you need the red, blue or yellow bottle? All these questions and more are answered in the video below.